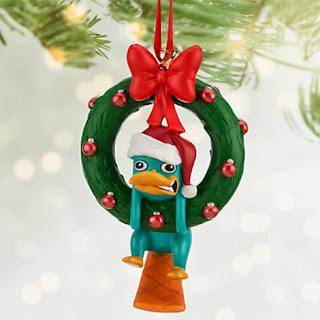 Sasaki Time: Giveaway: Perry The Platypus Ornament! Win a Perry The Platypus ornament! the ornament is for my son; he's a huge Perry fan! This would be a present for someone else. This would be a gift for my nieces and nephew. this would be for my daughter who loves perry. A gift for my son, even tho he is 21 he still loves this character. This is so cute, Perry is awesome! This would be for my mom, as a reminder of the Perry cake we once made and decorated together, and the fun disasters that happened during it's construction, as well as the things we learned along the way. Would love to have this on my tree. I dress up as Perry for Halloween every year. Thank you for the chance!! This would be for my 6 year old daughter who is a big Perry fan! this would be for me and my daughter - we love new ornaments for the christmas tree, and this one is so cute! It would be a family ornament!